One of the questions asked often is “how do you guys pick these bets?”. And to be honest It’s a valid and fair question. It’s like in investment/ stock broking where you need to decide, or have someone decide for you on the best option to invest in. Many of you out there might rely on tipsters, and prediction sites like Betloy for your selections each day, but we are sure that there are others who want to improve their betting knowledge and more importantly make money. There’s a million systems, staking plans and online guides about “how to make money from sports betting“, but let us tell you this from experience, the most important thing is “research.” Over time, you learn trends and habits, teams to invest on, teams to avoid, teams who are unreliable and your head will be your own portfolio of betting advice. We know that a team like Young boys of Switzerland are great for over 2.5 goals, So, it’s a bet we are waiting for in advance because of previous experiences. So for those who are curious to know whether we just go to Soccerway to pick games and put up on our website, to answer your question, this is a bird’s eyed view to the levels of intense research that goes into a single game. Research in Sports prediction can be grouped into Three different levels and that can help you understand a little better too. There is a low-level research, mid-level research and high-level research. If you can master the techniques from all 3 areas, you’ll have this betting nailed. But before we continue, let us just say that Low-level research does not mean that it’s poor research. When it comes to Sports betting, the most low-level research you can do is simply looking at which team is on top and placing a bet on them. Or seeing loads of shots on target and just backing goals blindly. Pre-game low-level research could be classed as simply looking at the WDWWLL next to a team for their last 6 games. Now this is where things get a bit more time consuming. By mid-level research, we mean consciously looking into what you’re backing. What’s the home team’s form at home? How many goals have been scored in their last 3 meetings? Before you back the first half goals, how many games at home this season have had a first half goal? Before you back the corners, how many do they average? What are their recent results against teams in a similar league position to the team that they are playing today? Now some of this you can find out easily on the internet (research sources are listed at the bottom) but some of it might just be in your head. For example, I know that Athletico Bilbao averaged around 11.5 corners per game in season, that’s just in my head and if you can keep stats like that locked away in your brain, it allows for quicker decisions, which is what’s needed when you’re betting. Now let’s take it a step further. Teams are made up of 11 players right, so you need to understand those players. How have Bayern performed this season without Lewandowski? Who is playing and who is missing? How long are they out for? Has there been a managerial change recently? Are the fans planning a protest? Are there any new signings and if so how did they perform at their last club? 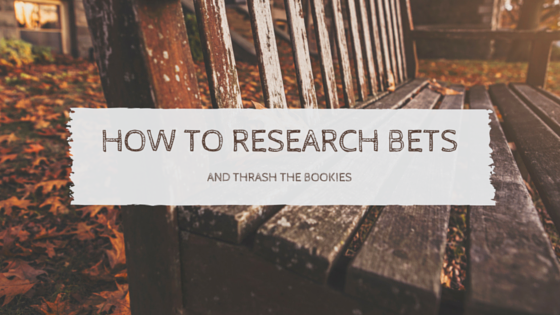 Knowing all of this is high-level research and can really help to take your betting to the next level. Of course there are more techniques than this, like watching a live stream and loads more, but learning everything you can possibly know puts you in such a solid position as a punter. Whenever a prediction is lost, so much Emotion comes into play. So how do we at Betloy handle losses because a lost game always cost us a very painful price? Well, just like in any investment that goes bad, after the initial anger we dust ourselves off and go straight back to researching, with the knowledge that long-term research pays off. It’s hard, and many people might not appreciate this, but we know that If you’re going to these levels to do research, it will pay off eventually. Where can I do this research? There are hundreds of great sites out there and it really depends on the level of research you want to do. There is flashscore that gives you all the parameters you need for a good research activity. But at Betloy, we cover all major Leagues and tournaments in the world. A very decent site, built in a simple manner to give users a great experience – we want to offer value. Betloy has created solutions that no other prediction site has ever created for sports fan around the globe. An Awesome, fabulous and functional web interface that has done the work of categorizing the best bets for you so that you can easily access whichever plan suits you. Email and SMS Platforms so that customers can access our winning games easily and as quickly as possible. We at Betloy have done all the digging around for you to the minutest detail so you do not need to have the slightest worry about the time consuming process of research. We hope this guide helped you. The more people out there learn the value of research and people who go to great lengths to do some research, the less reliance on scam sites promising you 100% wins. Our believe is that The only way to beat the bookies is to know more than them!